The population of the northern part of Taiwan has soared by nearly 4 million over the past few decades. In the meantime, the population of the central part of Taiwan has increased by 1.14 million, and that of the southern part of Taiwan has increased by 0.86 million. The growth tendency is focused on Taipei, and falls off with increasing distance. It's believed this is because of the central government's overall national development plan and national industrial policy. Depending on the research, "North-South divide" is composed of two theorems and backed by two forces., i.e North-South bias theorem derived from civilians in the mindset of feeling neglected and the theorem of the north-south difference originated from the KMT politicians who intended to distinguish those who retreated to Taiwan with KMT since 1949, from the voters. KMT fled to Taiwan at the end stage of the Chinese Civil War in 1949 and re-located in Taipei. In the following decades, KMT invested most of the resources taken from the mainland as well as collected taxes in public infrastructure, education institutes, scientific research centers, government institutions, high value-added industrial zones for Taipei and its satellite cities and suburbs in addition to KMT's North-South bias policy. At this point, northern Taiwan started to grow rapidly at the speed that had never seen before. The government expenditure spent on Taipei was in sharp comparison to southern Taiwan. The gap between two sides in all kinds of infrastructures widened significantly since then. Besides, KMT's economic policy to put industries of commercial activity, trade, new generation high-value-added technology industries together in northern Taiwan while arranging southern Taiwan to develop light industry, heavy industry, and labor-intensive industry amplified the north-south divide and southern Taiwan's encountered difficulties when Taiwan had no choice to transform its economic structure towards higher-value-added industry in order to compensate the rising unemployment rate caused by the tide of globalization that forces those labor-intensive and low value-added industries to move to low wage countries like China and Southeast Asia. Consequently, during the time KMT was in power, the number of the registered company continued to rise, ripen and strengthen. In contrast, of which in southern Taiwan kept experiencing speedy deterioration. This is the reason why northern Taiwan today is the center of Taiwan's economy and the leading high-tech concentrated area featuring dynamic business, tertiary sectors in addition to quaternary sector, information services, and quinary sectors. 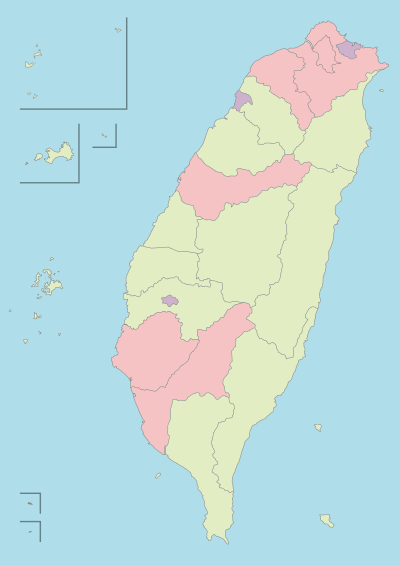 In the other hand, southern Taiwan is still home to Taiwan's primary sector and secondary sector. North-South bias was inferred to describe southern Taiwanese people's feeling. The far-off reason is that Taipei started to grab leaders attention through its way that produced a large amount of profitable tea and camphor in Qing dynasty. In 1874, Japanese invaded Taiwan for the first time. Subsequently, leaders began to consider Taipei very important and established many authorities institutions. Subsequent to Treaty of Shimonoseki, Japanese government located the ruling base in Taipei given Taipei has a plenty of government institutions to take over and its geolocation that is closest to Japan than any other major cities in Taiwan making it easier to serve Japanese as well as Taipei being the easiest place to be conquered in Taiwan followed by northern Taiwan,:36 unlike regions other than northern Taiwan that required Japanese soldiers to exert a great deal of forces for half a year to take down, which some scholars from the south speculate lead to the difference between the north and the south in culture and the way of thinking because they thought northern Taiwan was more often than not occupied and ruled by outcoming races who then spread its language and culture to northern Taiwan residents. Some scholars believed themselves the pure Taiwanese.） During Japanese rule, the Japanese intentionally designed and made using the most recent ideas and methods to build Taipei, Taipei was getting to be a city at the cutting edge of modern technology, leading Taiwan's politics and economy. Even so, the position vacancies in Taiwan were fairly distributed in that time rather than gathering only in northern Taiwan under KMT's ruling. Constant even distribution of jobs over Japanese ruling period effectively balanced the crowds' moving tendency, local business opportunities, local consumer market magnitude, and people's cost in looking for the jobs. In the following years, Taiwan gained fruits of its export-oriented economy. The central government started to use the gained fruits to directly fund a lot of infrastructures ranging from environmental remediation, illegal buildings removal, green constructions of park, urban park, national park, garden, and grassland, and build-up of new roads, expressways, state-run television corporations, trading centers, national libraries, museums, Mass Rapid Transit to headquarters for national-owned enterprises regarding electricity, water supply, petroleum, expansions of roads in downtown Taipei, northern Taiwan, government support for the start-ups of new future sectors, industrial parks included but not limited to Nangang Software Park and so on. The business boost effect accompanied by the rise of Taipei radiated to the nearby New Taipei City, Taoyuan City, Hsinchu City, Hsinchu County, and the northern Miaoli County. Taipei, the core of northern Taiwan, finally becomes the center of politics, economy, financial, cultural, media, education, researches in Taiwan. :24 As Hsinchu becomes the hi-tech center of Taiwan. Studies suggested that Kaohsiung, which is home to most of the heavy industry that fueled Taiwan's economic miracle, was also at the forefront of Taiwanese political liberalization activities from the 1970s onwards. Such activity includes the Kaohsiung Incident, which pushed Taiwan towards democracy, which studies also suggested, led to the Kuomintang government's decision to reduce southern Taiwan's economic development aid, as it regarded the protests in southern Taiwan as posing a great threat to its authoritarian rule. Although KMT didn't admit or respond to such revelation. This expounds on why most Taiwanese are bound for the south and leaving northern Taiwan leading to traffic jam in the south-bound when holidays or vacations are around the corner. Because they're not born and raised in northern Taiwan. They would like to go back to their hometown to reunite with their family during the vacations. As time comes to the end of the vacations or holidays, the traffic jam becomes north-bound. The general public in southern Taiwan keeps talking about the north-south divide in the aftermath of Taiwan's sector pattern transformation from labor-intensive sectors to high-tech sectors which gathered in northern Taiwan nowadays owing to central government's policy decades ago. The aftermath is long because it's still too difficult for people in southern Taiwan to find an adequate job within the decent range from hometown in addition to job hunting is everyone's must-experience in life. The calling of central government's north-south bias policy has been fueled by the accumulation of relative deprivation in the minds of southern Taiwanese :87–88 because they've found it truly matched their real-life experience. This section needs translation from zh to English. This section is written in zh. If it is intended for readers from the zh language community, it should be contributed to the Wikipedia in that language. See the list of Wikipedias. Please see this article's entry on Pages needing translation into English for discussion. If the section is not rewritten in English it may be deleted. KMT approved five of six science parks marked in blue 30-40 years ago approximately from 2019 in response to Taiwan's economic transformation from low-labor industries to high-end industries. Remaining science parks were established pretty late in time in comparison. During the end of the 1970s, Taiwan encountered a series of tough situations such as the U.S. decided to suspend the diplomatic relation with Taiwan in 1979 and establish formal diplomatic relation with China instead[note 3], 1979 oil crisis, Chiang Kai-shek's decision to quit the membership at the United Nation[note 4]. The accompanying shocks of thereof started to take into effect in the early 1980s. Moreover, KMT's authoritarian ruling style was subject to the Kaohsiung-based campaigns including Kaohsiung Incidence launched by DPP members calling for the central government to commit itself to the political reform and democracy, soaring of Taiwanese average wage. Taiwan's advantage at low-wage, low-skill-demand sectors continued to lose competitiveness compared to other developing nations, gradually resulting in bankruptcy. Under such background, KMT dealt with which by revising the economic policy to transform Taiwan's economic structure from labor-intensive sectors to capital-intensive sectors. As time goes by, under the effect of globalization, those process-export sectors originally settled in Taiwan started leaving for mainland China and the south-east Asian countries. At the meantime, the tide of globalization not only hit central and southern Taiwan's economy but also shook the economy of northern Taiwan. Nevertheless, because of KMT's preferential policy support by introducing newly-emerging higher-value-added sectors, such as semiconductors, and providing the targeted emerging sectors with tax cut, technical support, and other measures, the economy of the northern Taipei soon recovered from the chaos and grew faster than ever, making it end up becoming the region benefited from globalization. The adverse outcomes of the KMT-led central government's bias policy have had caused hundreds of thousands of young adults to take leave of their hometown and family and travel to northern Taiwan to seek work. And because the south is generally not as wealthy as the north, the prices paid for a family reunion at hometown have emerged to be a burden for them which in turn reduces their chances to see each other who have been forced to live apart in the aftermath of the long-term bias policy, generating an accumulation of nostalgia as well as homesickness in their minds. Although sophisticated Internet technologies have made communication easier than ever, those young workers often lie to their loved ones in the prevention of causing worries to the people they care. Nevertheless, their loved ones actually know their kids just pretend to be strong on the screen. Only seeing physically is to believing. Traditionally, south-western voters have favoured pan-green parties such as the Democratic Progressive Party while northern voters prefer pan-blue ones such as Kuomintang. Northern Taiwan has higher economic outputs than the south. In 2016, all northern cities and counties had a above-median per capita GDP. Population growth in north has been significantly higher than in the south. The divide has often been attributed to government bias. Following the Kuomintang's defeat by the Chinese Communist Party in the Chinese Civil War and the Nationalist's subsequent flight from the Chinese mainland, the Kuomintang relocated its headquarters to Taipei in the north of Taiwan. Since the Nationalist government's retreat to Taiwan in 1949, the Kuomintang has had held power for more than 60 years non-consecutively (1949-2000, 2008-2016), compared to the Democratic Progressive Party's 10 years (2000-2008, 2016-now). Owing to the Kuomintang's long-standing bias, especially over the White Terror period, the gap between the north and the south in terms of social economic development has gradually widened. Critics say that Northern Taiwan which mainlanders fleeing after the defeat of the KMT on the Mainland had mainly relocated had the dis-appropriate share of economic investment especially since the Pro-Independence movement was less common in the North than the South . The KMT was alleged to have concentrated investment in technological fields in its base in Northern Taiwan especially the Hsinchu and the Greater Taipei Metropolis area while investment in the South of Taiwan was mainly in industry. As industry relocated to Mainland China over the past decades leading to slower growth in Southern Taiwan, there has been a brain drain of younger college educated Taiwanese from the South to the North where higher paying service and technology industries are located. Over the period 1990-1998, Mayor of Kaohsiung Wu Den-yih frequently criticized the KMT-led central government for its bias in favour of the north and against the south. Studies also suggested that Kaohsiung, which is home to most of the heavy industry that fueled Taiwan's economic miracle, was also at the forefront of Taiwanese political liberalization activities from the 1970s onwards. Such activity includes the Kaohsiung Incident, which pushed Taiwan towards democracy, which some speculate lead to the Kuomintang government's decision to reduce southern Taiwan's economic development aid, as it regarded the protests in southern Taiwan as posing a great threat to its authoritarian rule. ^ Taiwan has been taken over by KMT since 1945. ^ See United Nations General Assembly Resolution 2758 for further in-depth info. ^ a b c d 邱燕玲 (2010-10-02). "南北區域經濟發展嚴重失衡…政府重北輕南 立院籲正視 - 政治". 自由時報電子報 (in Chinese). Archived from the original on 2017-12-23. Retrieved 2017-12-23. ^ a b Chris Wang (2011-08-18). "Tsai makes policy proposals on balanced development". Taipei Times. Archived from the original on 2018-06-16. Retrieved 2019-04-12. ^ a b c "两岸关系和平发展的巩固与深化". Google Books (in Chinese). Retrieved 2017-12-17. ^ a b c d e f g h i j k l m n o p q r s t u v 李晏甄 (January 2011). 指導教授：苗廷威. "台灣南北對立想像的興起 The Imagination of North-South Divisions in Taiwan" (PDF). 臺灣博碩士論文知識加值系統、國立政治大學社會學研究所 (in Chinese). Archived (PDF) from the original on 2017-12-24. Retrieved 2017-12-23. ^ 吳佩旻 (2018-01-03). "國圖南部分館奉行政院核定 有望縮短南北資源落差 - 生活新聞 - 生活". 聯合新聞網 (in Chinese). Archived from the original on 2018-03-28. Retrieved 2018-03-28. ^ 杜龍一 (2009-05-19). "立委陳亭妃指文化補助重北輕南總統馬英九要向南部文化人道歉". news.e2.com.tw. Archived from the original on 2018-03-28. ^ Chu, Tu-Bin; Liu, Tsai-Ching; Chen, Chin-Shyan; Tsai, Yi-Wen; Chiu, Wen-Ta (2005-09-02). "Household out-of-pocket medical expenditures and national health insurance in Taiwan: income and regional inequality". BMC Health Services Research. Springer Nature. 5 (1). doi:10.1186/1472-6963-5-60. ISSN 1472-6963. As discussed above, uneven distribution of medical care resources in Taiwan has been the target of much criticism. Most resources are concentrated in the North where the population has higher accessibility to health care than residents in non-northern areas (Center, South, East). ^ Chu, Tu-Bin; Liu, Tsai-Ching; Chen, Chin-Shyan; Tsai, Yi-Wen; Chiu, Wen-Ta (2005-09-02). "Household out-of-pocket medical expenditures and national health insurance in Taiwan: income and regional inequality". BMC Health Services Research. Springer Nature. 5 (1). doi:10.1186/1472-6963-5-60. ISSN 1472-6963. ^ "調查看天下／當舉債成為地方政府重要財源…｜天下雜誌". 天下雜誌 (in Chinese). 2015-07-28. Archived from the original on 2017-12-23. Retrieved 2017-12-23. ^ a b c d e "全球傳播與國際焦點". Google Books (in Chinese). Retrieved 2017-12-23. ^ "國家圖書館 期刊文獻資訊網 中文期刊篇目索引：參考文獻列表". Apache Tomcat/4.1.31 (in Chinese). Archived from the original on 2018-11-11. Retrieved 2018-11-11. ^ a b 鄧瑞兆; Teng, Ruey-Jaw (2014-06-26). "高雄都會區產業發展與人口就業之研究". Chung-Hua University Repository (in Chinese). Retrieved 2017-12-17. ^ a b c d e f g 中央研究院、林季平 (2018-03-21). "逢年過節，返鄉人潮為何一路向南？". 研之有物│串聯您與中央研究院的橋梁 (tertiary source) (in Chinese). Archived from the original on 2018-03-31. Retrieved 2018-05-09. 官方沒有親口證實，美麗島事件等政治挑戰，也可能削弱了當時執政黨對南臺灣區域經濟發展的支持度。問及會否擔心不同立場的壓力，林季平堅定地回應：「學術研究就是據實以報，真理會越辯越明，只是負面攻擊的話沒意義。」「......獨裁者與煽動者，才是萬惡之源。而借鏡戰爭史，知識份子要勇敢成為阻擋戰爭的防線。」或許這也是，為什麼林季平要以有憑有據的學術研究，涉入勞工之戰，儘管背後會中了許多槍。 Cite error: Invalid <ref> tag; name "研之有物│串聯您與中央研究院的橋梁 2018" defined multiple times with different content (see the help page). Cite error: Invalid <ref> tag; name "研之有物│串聯您與中央研究院的橋梁 2018" defined multiple times with different content (see the help page). ^ a b Andersson, Martin; Klinthäll, Martin (2012). "The opening of the North–South divide: Cumulative causation, household income disparity and the regional bonus in Taiwan 1976–2005". Structural Change and Economic Dynamics. Elsevier BV. 23 (2): 170–179. doi:10.1016/j.strueco.2012.02.001. ISSN 0954-349X. ^ a b c "The Geography of Voting Patterns in Taiwan –Ballots & Bullets". School of Politics & International Relations, University of Nottingham. 2011-11-02. Archived from the original on 2018-11-09. Retrieved 2018-11-09. ^ a b c Raffer, Kunibert (2001). The economic North-South divide : six decades of unequal development. Cheltenham, U.K. Northampton, Mass: Edward Elgar. ISBN 978-1-84376-145-7. OCLC 49852584. ^ a b c Achen, Christopher (2017). The Taiwan voter. Ann Arbor: University of Michigan Press. ISBN 978-0-472-05353-7. OCLC 999442809. ^ a b TSAI, CHIA-HUNG (2016). "Regional Divide and National Identity in Taiwan: Evidences from the 2012 Presidential Election". Issues & Studies. World Scientific Pub Co Pte Lt. 52 (02): 1650007. doi:10.1142/s1013251116500077. ISSN 1013-2511. ^ JINN-YUH HSU (May 2011). "State Tansformation and Regional Development in Taiwan: From Developmentalist Strategy to Populist Subsidy" (PDF). International Journal of Urban and Regional Research. 35 (3): 600–619. doi:10.1111/j.1468-2427.2010.00971.x. Archived (PDF) from the original on 2019-04-03. Retrieved 2019-04-04. ^ Chang, Bi-yu (2004-12-01). "From Taiwanisation to De-sinification. Culture Construction in Taiwan since the 1990s". China Perspectives (56). ISSN 2070-3449. Retrieved 2019-04-03. ^ a b c d e f g h i j 林季平 (2005). "台灣的人口遷徙及勞工流動問題回顧：1980-2000". researchgate.net (in Chinese). Archived from the original on 2018-05-10. ^ "What's behind the China-Taiwan divide?". BBC News. 2016-12-03. Archived from the original on 2018-08-25. Retrieved 2018-11-09. ^ 鍾豔攸 (1999). 政治性移民的互助組織－台北市之外省同鄉會(1946-1995) Mainlanders Native Place Associations in Taipei,1946-1995 (in Chinese). 台北: 國立台灣師範大學/歷史學系/碩士. ISBN 978-957-9628-51-8. OCLC 45371330. ^ a b 楊重信 (1990). "台北都會發展與展望". 台北都會區發展研討規畫論文集. ^ 姜渝生、王小娥 (2011-01-28). "An Empirical Analysis of the Regional Distributional Weights for Allocating Transportation Investment Funds in Taiwan. 台灣地區重大交通建設區域分配權重之實證分析". 國立成功大學機構典藏 (in Chinese). Retrieved 2019-03-09. The variance of benefit estimates was also calculated using the KR method. The benefit estimates were then allocated to four regions namely, North, Central, South, and East. With the decision indicators of one for accepted and zero for rejected for each project, the estimated regional weights indicated the revealed preferences of the decision maker. For the projects in the past, the regional weights were estimated to be 1, 0.48, 0.26, 0.08, indicating that the North Region was significantly preferred than other regions. For the on going and future projects, the regional weights were estimated to be 1, 0.73, 0.56, 0.0, indicating that the inequality between North-South Regions has been reduced. However, the difference between the Eastern-Western corridors is becoming significant. ^ a b c d e Lin, Ji-Ping (2012-01-24). "Tradition and Progress: Taiwan's Evolving Migration Reality". migrationpolicy.org. Archived from the original on 2017-10-03. Retrieved 2018-05-09. ^ a b c d e Lin, Ji-Ping (2016-02-28). "Taiwan Temporary Workers and Labor Marginalization in the Context of Segmented Labor Market, 1991-2010". Arbor (secondary source). Departmento de Publicaciones del CSIC. 192 (777): a291. doi:10.3989/arbor.2016.777n1007. ISSN 1988-303X. ^ Lin, Ji-Ping, 2016, “Taiwan Temporary Workers and Labor Marginalization in the Context of Segmented Labor Market, 1991-2010”, ARBOR-CIENCIA PENSAMIENTO Y CULTURA, Vol.192, No.777, 291. ^ Cite error: The named reference 自由評論網 2018 was invoked but never defined (see the help page). ^ "科技部-園區分布及介紹". 「科技部全球資訊網」(MOST) (in Chinese). 2010-01-21. Archived from the original on 2019-03-02. Retrieved 2019-03-01. ^ Ming-Ching Luoh (2002-03-01). "Who are NTU Students?-Differences across Ethnic and Gender Groups and Urban/Rural Discrepancy". 經濟論文叢刊. pp. 113–147. doi:10.6277/ter.2002.301.5. Archived from the original on 2017-08-14. Retrieved 2018-10-25. ^ 駱明慶(Ming-Ching Luoh) (2001-06-01). "Differences in Educational Attainment across Ethnic and Gender Groups in Taiwan". 經濟論文叢刊. 2 (29): 117–152. doi:10.6277/ter.2001.292.2. Archived from the original on 2018-10-25. Retrieved 2019-03-01. ^ a b 李義 (2018-10-10). "《韓國瑜 幫我回家》逼哭北漂族". 中時電子報 (in Chinese). Archived from the original on 2019-03-02. Retrieved 2019-03-01. ^ CTi News. "20181103中天新聞女兒北漂拚未來媽媽「掛完電話就大哭」" [The mom whose child is working in northern Taipei bursted into tears everytime when hanging up the phonecall with her beloved child]. ^ CTi News. "【精彩】韓國瑜鳳山造勢‧全民開講（一） 年輕人、北漂族的心聲 政府聽到了嗎？" [Han Guo-Yu's campaign] (in Chinese). ^ According to  Archived 2017-11-09 at the Wayback Machine (IMF-WEO April 2017), PPP rate is NTD 15.11 per Int'l.dollar; according to the  Archived 2017-11-23 at the Wayback Machine, the average exchange rate is NTD 32.258135 per US dollar (the average exchange rate of the year was 32.258135 NTD to 1 USD); GDP per capita figures in USD are retrieved from  Archived 2018-02-21 at the Wayback Machine and are published by National Statistics of Republic of China (Taiwan) Archived 2017-10-30 at the Wayback Machine. ^ 姜渝生; 王小娥 (2011-01-28). "國立成功大學機構典藏:Item 987654321/104327". 國立成功大學機構典藏 (in Chinese). Retrieved 2017-12-17. ^ a b 李晏甄 (January 2011). "台灣南北對立想像的興起" (PDF). 臺灣博碩士論文知識加值系統、國立政治大學 (in Chinese). Archived (PDF) from the original on December 24, 2017. Retrieved December 23, 2017.